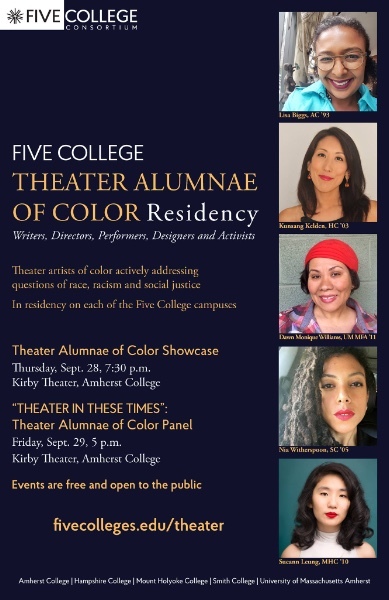 The Five College Consortium is hosting a Theatre Alumnae of Color Residency today and tomorrow, with events at the Kirby Theater at Amherst College. Don't miss the showcase or the panel. Pioneer Valley Ballet is hiring an office and program assistant for their Easthampton studios. Check out the job posting below for more information. I caught up with Taylor Mac while judy was on vacation in Provincetown. Taylor is currently a playwright in residence with HERE in New York and we had a chance to talk about what judy's working on and as with Taylor everything else we could think of! Performing artists of color who have graduated from Five College campuses will return to the consortium to work with students in residencies, offer the public a demonstration of their work and participate in a panel discussion. Organized by the theater department chairs of the campuses, the residency, showcase and panel discussion are designed to feature accomplished alumnae from each of the Five Colleges presenting the work of artists who are deeply engaged not only with theater-making but also with issues of social justice. The aim of the events is to facilitate discussions of race and gender across multiple disciplines and institutions, and to connect students to alumnae whose work is activist, visionary and inspiring. It will feature: Lisa Biggs, Amherst ’93; Kunsang Kelden, Hampshire ’09; Sueann Leung, Mount Holyoke ’10; Nia Witherspoon, Smith ’05; and Dawn Monique Williams, UMass MFA ’11. The Tony Award-winning musical was adapted from Robert James Waller's 1992 book, which also inspired the hit film starring Meryl Streep and Clint Eastwood. The story revolves around Francesca Johnson, an Italian war bride living in Winterset, Iowa in 1965. She has had eighteen years of a largely unfulfilling farm life, and when her husband Bud and two teenage children leave Iowa to attend a national 4H fair, she looks forward to a weekend free from responsibility. But then a stranger named Robert Kincaid, a photographer for National Geographic, drives up seeking directions to the covered bridges he's been assigned to photograph, and from that moment both of their lives change. Cast members include Heather Hannon (Francesca), John Baker (Bud Johnson), Joe Casey (Robert Kincaid), Bryan Austermann (Michael), Molly Damon-Rush (Carolyn), Margie Secora (Marge), Kevin Reid (Charlie), and Kaytlyn Vandeloecht (Marian/Club Singer/Waitress). Theater Project Founder Danny Eaton is producing director, Mitch Chakour is music director and set design is by Greg Trochlil. Costume design is by Dawn McKay, and Dan Rist is lighting designer. Cate Damon is stage manager, and production manager is Stephen Petit. Ticket for the play range from $23-$33 and are now available by calling or visiting the box office during its hours of operation, which are Monday through Friday 10am – 5pm and Saturday 10am – 1pm. For additional information, visit the website. MOONFISH THEATRE'S "STAR OF THE SEA"
Set in 1847 aboard the ship the Star of the Sea as it journeys from Cobh to New York during the Great Famine, “Star of the Sea” follows a twice scorned servant, her landlord’s weak willed son and a suspected killer as they head to America. Star of the Sea addresses the complexity of the Famine, and the individual tragedies that are often lost among statistics. As well as capturing the epic nature of O’Connor’s book, this bilingual production breaths a fresh life into the characters through the use of both Irish and English language along with traditional song, live music and movement. Post-show talk with the members of the company immediately following each performance. Please call the Box Office to see if you or someone in your party is eligible for a discount. More info. Twenty different residents of tiny Tuna, Texas, come to life onstage in Silverthorne Theater’s production of the perennially popular comedy, Greater Tuna. Two of Silverthorne’s favorite actors, John Reese and Julian Findlay, take on the play’s challenging lightning-fast costume, voice and persona changes under the direction of veteran Valley theater artist Steve Henderson. There will be a post-show conversation with the director and cast after the October 12 performance. The Hawks & Reed PAC is located at 289 Main Street on the Greenfield Common in the middle of the town’s Cultural District. It is air-conditioned and handicapped accessible. Written by Texans Ed Howard, Joe Sears, and Jaston Williams, Greater Tuna brings us a day in the life of the third smallest town in Texas as seen through the eyes of OKKK Radio Station announcers Arles Struvie and Thurston Wheelis. 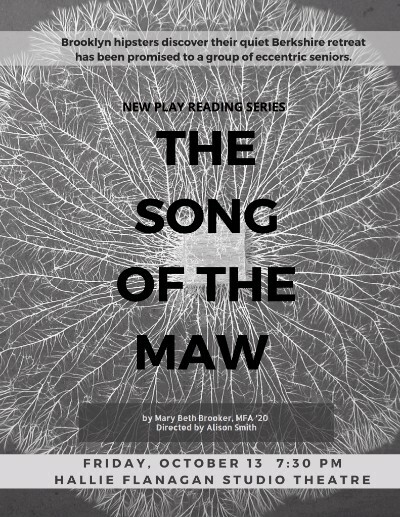 In the course of the play, the two morph into such characters as Vera Carp, self-appointed guardian of the town’s morals; Petey Fisk, the desperate head of the local SPCA; Bertha Bumiller, a housewife who has lost control of her children, husband and pets; and many others. The trials and tribulations of this wild assortment of personalities reflect beliefs and practices that may mystify New Englanders. By many standards, the play is anything but poitically correct, but behind the accents and opinions are small-town folks with problems and aspirations with which we can identify. Tickets are $20 general admission, $18 for students or seniors (65+) and may be purchased online at www.eventbrite.com. Full information and tickets available at www.silverthornetheater.org. 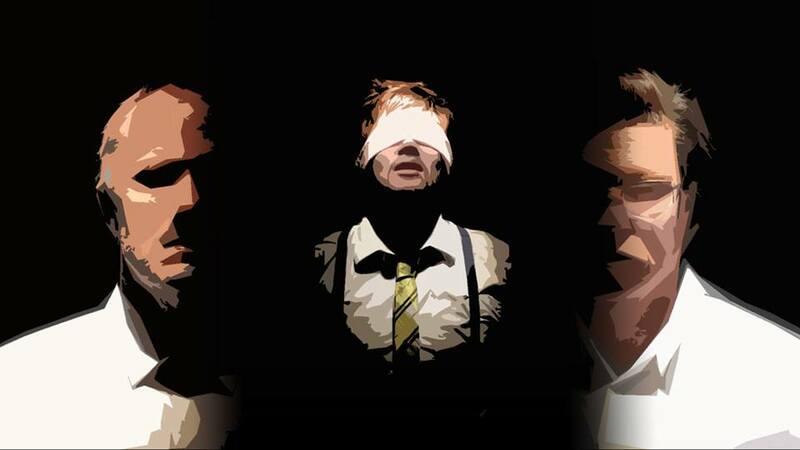 With echoes of Stoppard, Kafka, and the Brothers Grimm, THE PILLOWMAN centers on a writer in an unnamed totalitarian state who is being interrogated about the gruesome content of his short stories and their similarities to a series of child murders. The result is an urgent work of theatrical bravura and an unflinching examination of the very nature and purpose of art. Brooklyn hipsters Bette and Axel have retreated to a cabin in the Berkshires for a quiet weekend, only to discover the cabin has been promised to a group of eccentric seniors who are conducting an end-of-life ritual. Haphazard and sincere, this ceremony in the woods results in a conjuring of worlds unconscious and mythic. A mother from New Jersey roams the hills of Lockerbie, Scotland, looking for her son's remains that were lost in the crash of Pan Am Flight 103. 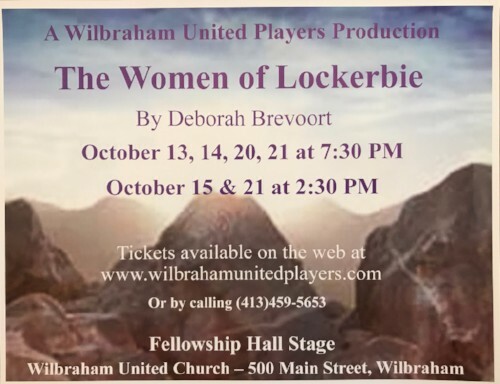 She meets the women of Lockerbie, who are fighting the U.S. government to obtain the clothing of the victims found in the plane's wreckage. The women, determined to convert an act of hatred into an act of love, want to wash the clothes of the dead and return them to the victim's families. 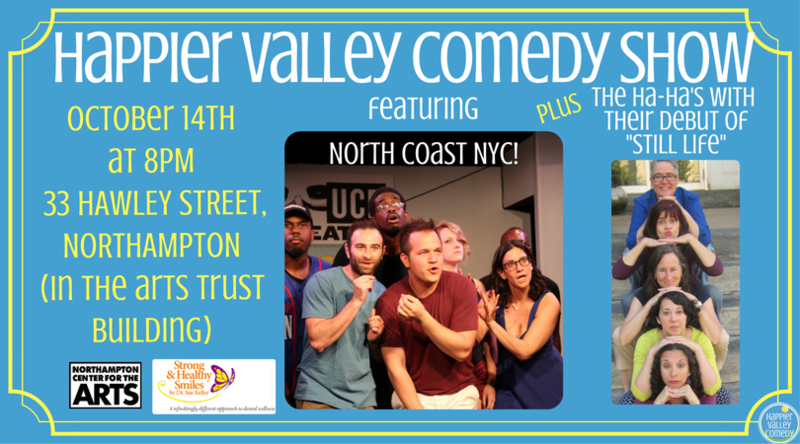 Join us this October in welcoming our special guest, North Coast, to the Happier Valley Comedy Show! North Coast is New York City’s premier hip hop improv comedy team. Their explosive performances have been packing comedy venues, universities, and festivals nationwide since 2009. Built around a single suggestion from an audience member, the show’s improvised scenes escalate into full-blown hip-hop songs, facilitated by a live beatboxer. With their seamless melding of comedic timing and freestyle rapping abilities, North Coast frequently blurs the line between comedy show and concert, drawing audiences from the comedy, hip-hop, and theater communities for an experience that has been hailed as “mind-blowing” and “next level” by critics and audiences alike. In the second act, Valley favorites The Ha-Ha's are excited to debut their new piece "Still Life,"
in which they create a space and improvise the characters and situations that inhabit that space. Open improv jam for everyone and anyone to play and watch improv games, plus a showcase set featuring this month's up-and-coming improv team, BOOP! Improv. BOOP! Improv creates scenes and stories via the art of long-form improvisational theater. A duo with unique chemistry, they bring their audience on a journey through humor, reality, wit, and a keen depth of characters and stories. Suggested donation: $3-5. 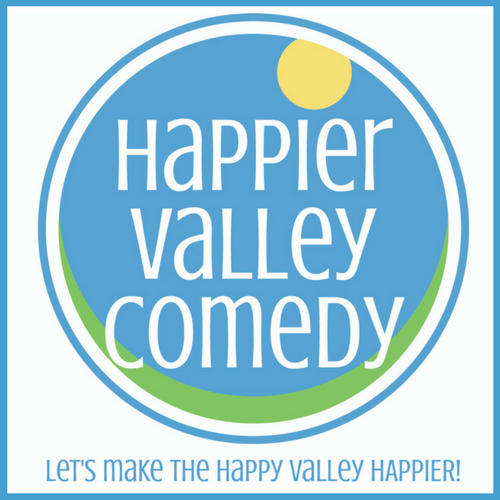 For more info: www.happiervalley.com. For more information or to apply, send an email. The Office and Program Assistant is responsible for supporting the day-to-day operations of the Pioneer Valley Ballet office including front desk reception, interfacing with families, dancers and the general public, and general facilities support along with the administrative aid of essential PVB programs including the children’s casts of The Nutcracker and spring performances, and year-round pre-professional and community training programs. This position works closely with all staff members and volunteers, and requires team playing, leadership skills, innovative problem-solving, and adaptability. Serve as receptionist during normal business hours; Maintain a professional, supportive, and friendly reception area including assisting parents, students and visitors, updating bulletin boards as needed, and tidying the front lobby as needed; Interface with vendors; Answer inquiries via telephone, email, written correspondence and in person. Respond to all inquiries in a prompt and accurate manner; Maintain organized and secured office files; Receive and sort snail mail and emails; Maintain inventory of office supplies and obtain miscellaneous supplies as directed by the Program and Operations Director and/or Artistic Directors; Process student program registrations; Help with overseeing Children’s casts for PVB productions which includes regular informational correspondence, cast check-in and out, and schedule coordination with input from the Program and Operations Director and Artistic Directors; Maintain ongoing training program informational correspondence; Coordinate Educational Outreach mailing, contacts and registrations; Maintain accurate mailing lists, and assist with preparation of program correspondence and marketing materials; Maintain a working knowledge of updated program information, dates, and deadlines;Additional administrative duties as directed by the Program and Operations Director and Artistic Directors. Office conditions. Some lifting of bins/boxes no heavier than a full laundry basket. WIG FLU is seeking a ensemble of drag & queer performers with all levels of experience that includes performers of color and differently-abled individuals. 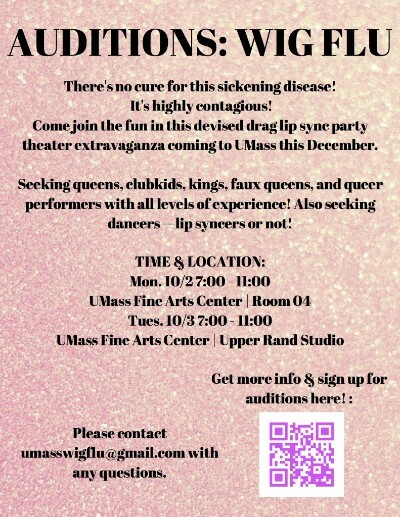 We are also seeking dancers -- lip syncers or not! For more information on WIG FLU, check out the Facebook event. To sign up for auditions, go here. What's going on at UMass Theater? We're marking the beginning of the 2017-2018 season with a kick-off celebration! Curious about what we do over in the Fine Arts Center but not ready to spend money — or a lot of time? Come to the Rand Theater, located off the FAC Lobby, for the UMass Theater Season Kick-off Celebration on Oct. 5 from 5:30 - 6:30 pm. One of them’s a musical. Most of them have funny parts. Some of them are brand-new. One’s about a flower who wants to get married! It’s free, it’s going be an emotional journey, and there will be food after — what’s not to love? To sum up: Shows! Food! Prizes! You’ll be done in an hour! We’d love for you to come to our party.